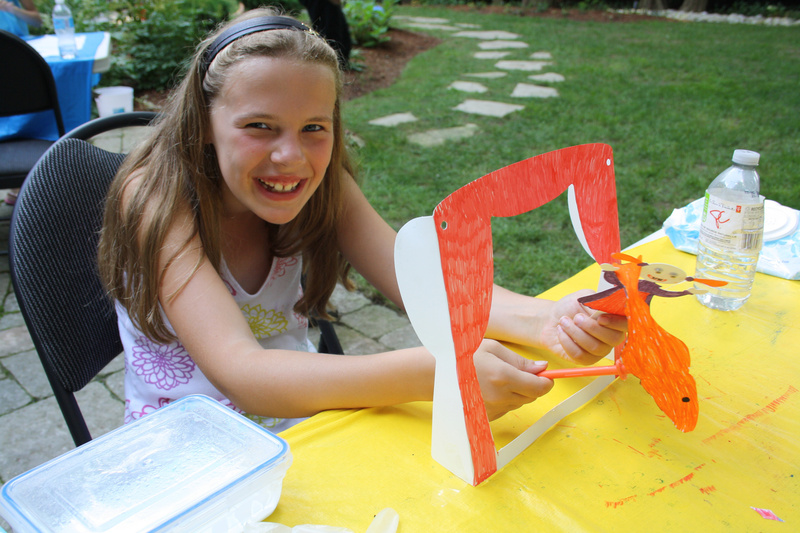 Play and perform with your personalized puppet theatre! The projects are die-cut to look like theatre curtains and come with two puppet cutouts to decorate and use as characters in your very own play! R39201 My Very Own Puppet Theatre projects are each hole-punched on either side so they can be threaded with string and worn like a great big necklace. First pop out the puppet theatre from the backing. Color in the theatre with bright marker colors, like red or purple! Color in the puppet characters as well. The characters are cut with a handle so they are easy for kids to hold. One of our art campers came up with an idea to make her own puppet character. She used card to cut out a fish shape, colored it in, then attached it to one of our Goo Spreaders! Your students can experiment with different ideas like this. Kids can wear the puppet theatre and perform puppet plays anywhere! Read the Puppet Theatre full web guide here to discover curriculum connections and great activities for the classroom. hanks for checking out this post! Like us on Facebook, Share this post with your friends, or Subscribe to this blog today to receive original craft project updates every Monday, Wednesday and Friday! This entry was posted in Crafts, Language Arts and tagged activities, drama, dramatic arts, kids, perform, performance play, play, puppet, puppet theatre, summer, theatre by roylcoblog. Bookmark the permalink.